Let’s clarify: Third Day is a big band. What you (and they) don’t realize is just how big they are going to get. Of course, you would think they’d be able to comprehend their influence. Multiple Dove Awards and GRAMMY Awards have to stand for something, right? Yet, even with all the accolades, millions of albums sold and worldwide tours, Third Day recently found itself giddy at some of the latest news of its impact while recording the band’s brand-new studio project, Revelation (Essential). “There really have been so many amazing moments we can look to,” explains bassist Tai Anderson about understanding their cultural impact. “We still have notebooks full of letters that are amazing—from soldiers, prisoners, missionaries and people all over the world. But one cool thing that happened while making this record was when Lacey [Mosley] from Flyleaf came to sing. She was singing, and at the very end of the song ‘Run to You,’ [vocalist] Mac [Powell] had encouraged her to go for it and ad-lib—to just worship and sing whatever. I still listen to that part of the song and get goose bumps. Mosley is not the only big-name collaborator on Revelation, which also includes Chris Daughtry of the band bearing his namesake and legendary guitarist Robert Randolph. Even those behind-the-scenes are some of the music industry’s biggest names, with production from Howard Benson (My Chemical Romance, Daughtry) and mixing from Chris Lord-Alge (Bruce Springsteen, James Brown, Green Day). “What was funny with this record is that we got everything we could have wanted,” says Anderson. “We’ve learned that the limitations that people feel for Christian music are self-imposed. We can prevent our own progression. If we could just be bold enough to go for what we really want, we might actually get it. We’ve learned this over the years. We wanted Brendan O’Brien [Pearl Jam, Stone Temple Pilots, Train] to mix our albums for years, and we were told that it couldn’t happen. So finally, I just picked up the phone, called him myself and he said, ‘Oh yeah, I love the band. I’d love to do it.’ Along the way, people were just assuming he wouldn’t do it. A recent cover of Billboard is the latest prize for Third Day—a first-ever accomplishment for a Christian band. It’s a sign that the band won’t have to worry too much about rejection in the future. And for a band already as big as they are, that’s an exciting proposition. 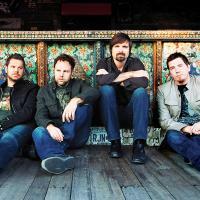 For more info on Third Day and Revelation, log on to thirdday.com. © 2008 CCMmagazine.com. All rights reserved. Used with permission. **This interview first published on July 30, 2008.